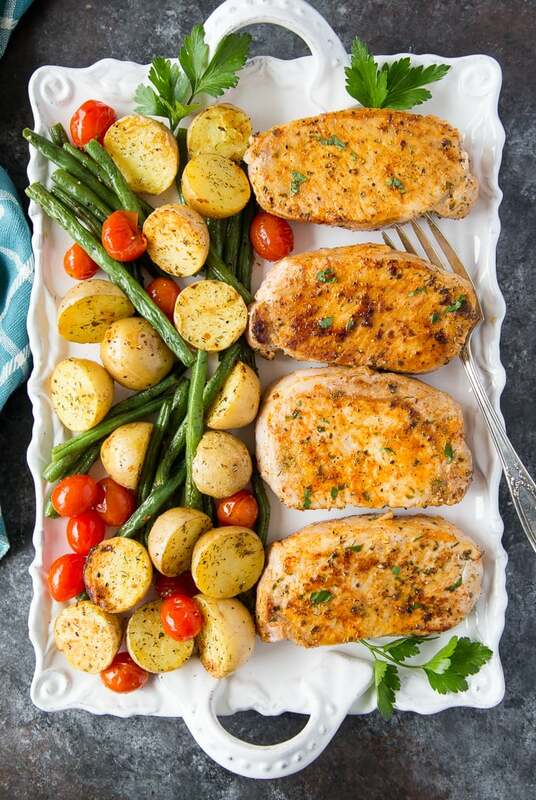 Ranch Pork Chops + Potatoes – A quick and easy sheet pan dinner, perfect for busy weeknights. Delicious, juicy & tender pork chops, crispy potatoes and roasted green beans seasoned with homemade (5 minute) healthy Ranch seasoning. Sheet Pan dinners are the answer to the mid-week meal dilemma! It’s so easy when you can cook everything on one sheet pan (which also makes clean up a snap!) but add 1) RANCH seasoning (kid friendly!) and 2) that you only need about 5 minutes prep time for this meal and I think you just might have a new favorite to add to your weeknight rotation schedule ! Cut baby potatoes (8-10 baby potatoes) in half. 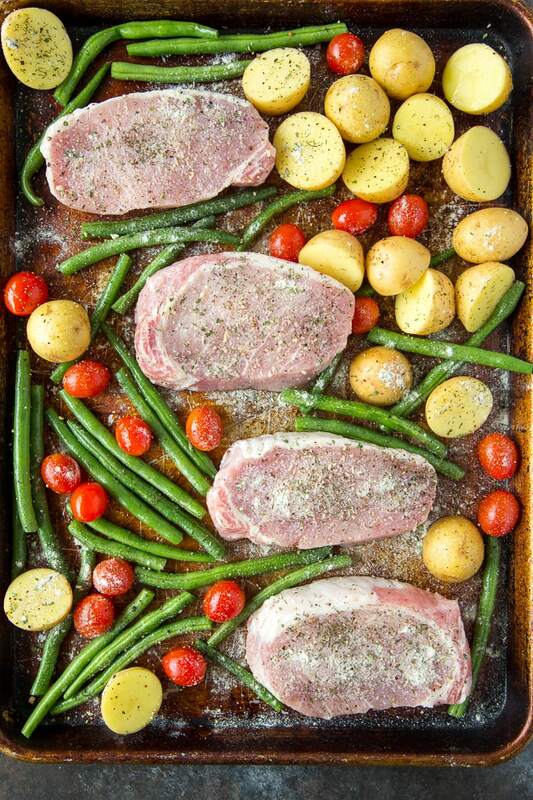 Place pork chops, potatoes, green beans and cherry tomatoes on a sheet pan. Drizzle with olive oil. Sprinkle with Ranch seasoning. 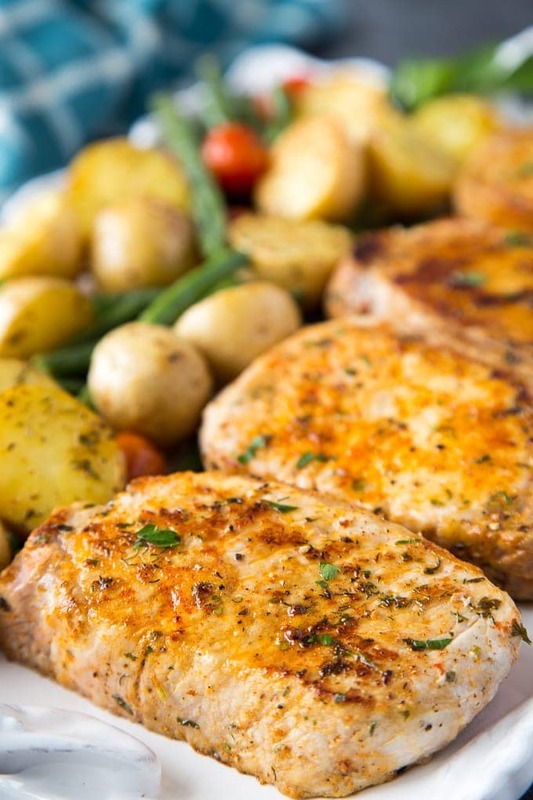 Bake for 20-25 minutes until pork chops are thoroughly cooked through and potatoes are crispy. The Ranch seasoning is what MAKES this meal! The combo blend of buttermilk, onion, garlic, parsley and dill works so well with the pork, potatoes and veggies. I’m including the recipe to make your own healthy Ranch seasoning mix ( in less than 5 minutes) but if you prefer you can use a packet of your favorite ranch dressing and seasoning mix instead. Some of the popular ranch seasonings include a bunch of preservatives and MSG so I’d recommend looking for a natural brand ( like Simply Organic – available at many stores like Whole Foods, Walmart or on Amazon) if you decide to go the packaged route. Ranch Pork Chops + Potatoes - A quick and easy sheet pan dinner, perfect for busy weeknights. Delicious, juicy & tender pork chops, crispy potatoes and roasted green beans seasoned with homemade (5 minute) healthy Ranch seasoning. Preheat oven to 400° F. Spray a baking sheet with nonstick spray, set aside. 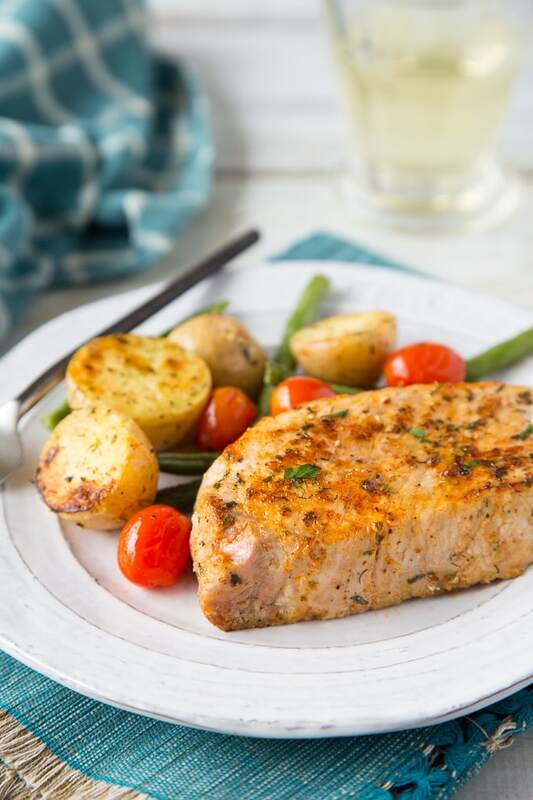 Place pork chops, potatoes, green beans ** and tomatoes on baking sheet. Drizzle with olive oil and toss to evenly coat. Sprinkle with ranch seasoning, paprika and salt & pepper. Roast in oven until pork is completely cooked through (it should reach an internal temperature of 145° F) and potatoes are fork tender ( Approx. 20-22 mins.) Optional step: Switch oven to broil and cook for 2-3 minutes to get slightly charred edges to the pork, potatoes and veggies. ** if you prefer crisp tender green beans wait to add them until pork/potatoes/tomatoes have cooked for 10 minutes then add green beans to sheet pan and return to oven for the last 10-15 minutes of cooking. Ok, let’s talk about this. Two words- LOVED IT. Easy, takes 30 minutes including prep. super delicious and one pan to wash. This is a new staple. We are a family of two so I was expecting plenty left over to add to a salad tomorrow. There is only one lonely chop left. Here’s a little tip, don’t do what I did and sprinkle your olive oil while they are in the pan. Dirty one dish and one bowl and season and oil the veggies, potato and tomatoes in a bowl, and the meat on a dish then add to the sheet pan. (be generous with paprika and pepper) this extra step will prevent getting your non meat food from getting soggy. I honestly cannot tell you how easy and fast and fabulous this meal was. I am going to try the very same thing with chicken breasts and other firm veggies. ….You’ll love ti. This is the best blog out there.